There’s few things as glorious to a home cook stretched for time as a one pan dinner. Extreme bonus points are earned when you also take a typical one pan dinner and add a twist that the kids won’t freak out on and the grown ups feel is a little more unique and special. 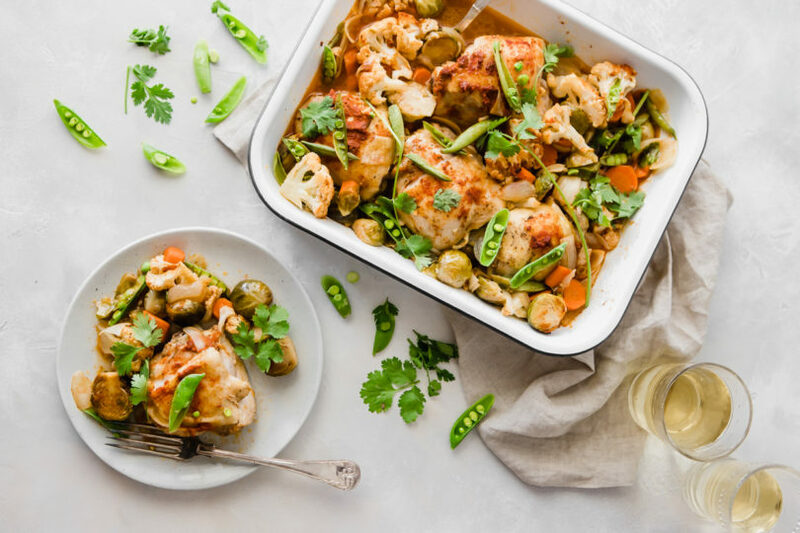 Enter this chicken and vegetable bake that incorporates the creaminess of coconut milk and the subtle spice of Thai curry paste. The thing I love about these type of one pan tray bakes is the ease with which you can adjust ingredients to just about any vegetable and seasonings you have on hand, and the formula is just about the same. 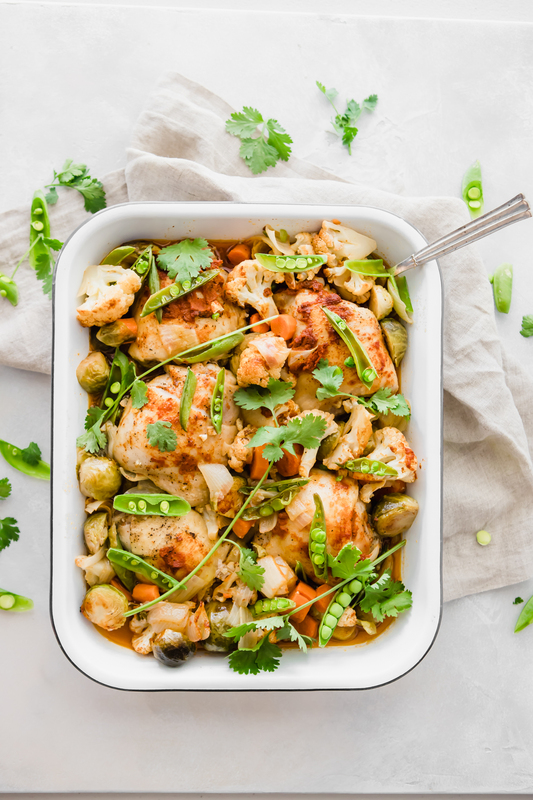 Chicken (either breasts or thighs & drumsticks) + vegetables of choice + seasonings of choice + fat in form of oil so things don’t dry out = totally versatile one pan dish. 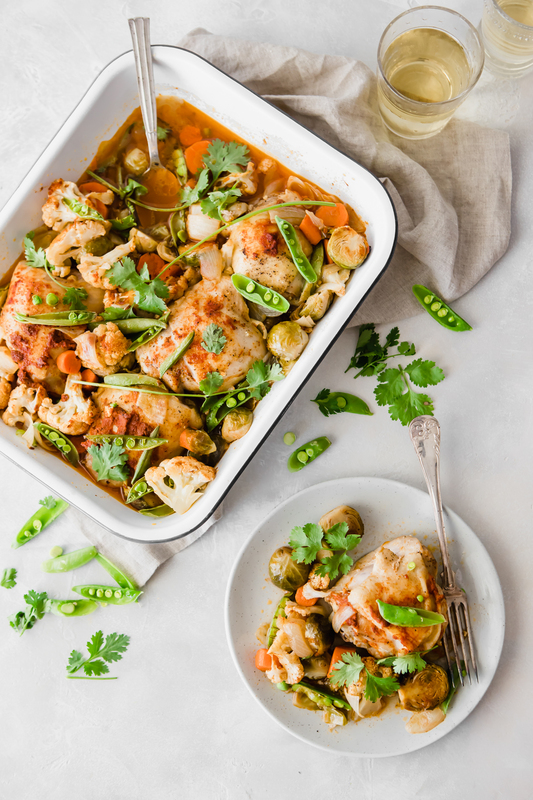 This dish uses bone-in skin-on chicken thighs, cauliflower florets, halved Brussels sprouts, onion and carrots, with some snap peas tossed in half way through baking. And of course it uses the perfectly paired coconut + curry as it’s fat & seasonings to flavor the dish and make it moist. 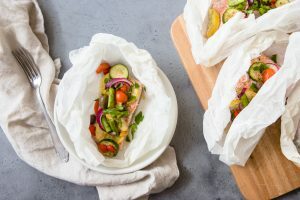 And don’t worry, if you stick to using a Thai curry paste that is very mild in flavor like the one I use, it’s not at all too hot for the kids, providing just a very subtle amount of flavor and heat. Oh, and if you think about it ahead of time, definitely brine the chicken for a few hours. A simple process that enhances the flavor and moistness remarkably well. My simple go-to brine recipe is 2.5 cups water + 2 tbsp kosher salt. Combine in a sauce pan and heat till salt is dissolved. Let cool, then pour brine over chicken, either in a deep bowl which allows for full submersion of the chicken, or in a gallon size Ziploc bag, and allow to sit in the fridge for a few hours. Before using, simply rinse chicken and go about your business. 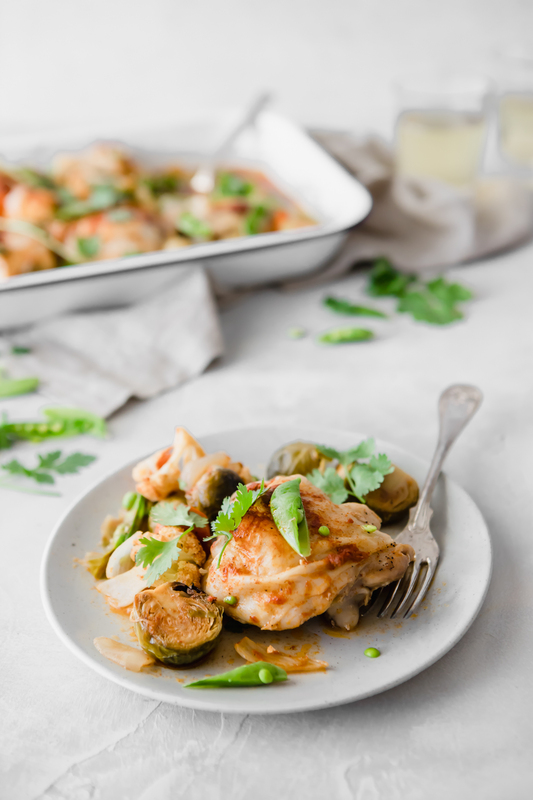 A simple yet delicious one pan dinner with a flavorful twist incorporating coconut milk and Thai Curry paste. Layer chicken then veggies in a baking dish and drizzle with the olive oil and season with salt and pepper. Brush on red curry paste with a pastry brush or spoon. Bake 30 minutes if using thighs and 20 minutes if using breasts, then remove from oven and stir in coconut milk. Optional to add in sugar snap peas at this time. Bake for an additional 10-15 minutes until veggies are done and chicken reaches 165 degrees. 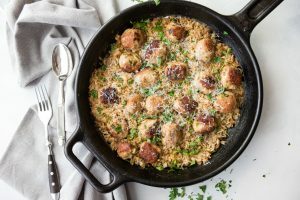 Serve with jasmine or cauliflower rice. My simple go-to brine recipe is 2.5 cups water + 2 tbsp kosher salt. Combine in a sauce pan and heat till salt is dissolved. Let cool, then pour brine over chicken, either in a deep bowl which allows for full submersion of the chicken, or in a gallon size Ziploc bag, and allow to sit in the fridge for a few hours. When ready, simply rinse chicken and pat dry, then use accordingly. I absolutely love curry! I definitely want to try this recipe. pinning now!